Posted on June 3, 2017	by chainsoff. Geopolitics–By now, the Deep State vulture mainstream media, and pseudo-alternative media alike, have already fed themselves to the brim with the latest Trump “leaking of state secrets,” regarding the specific number of US nuclear submarines at the bottom of the North Korean EEZ, to a “killer” named Duterte. Locally, the group loyal to the former Secretary of the Department of Foreign Affairs in the Philippines, Albert del Rosario, is now being tagged as the one behind the actual leaking of the Trump-Duterte phone call transcript that the Omidyar funded online media, Rappler and The Intercept, have proudly released for online publication. While this is a non-news to most of us on this site, but this has been used to serve the Deep State’s agenda and that of the publishers, too, solely to malign the Philippine president, and others like him, with sheer nothing. Rappler is part of the local mainstream media, which has been instrumental in feeding the West with the wrong interpretation of police data as to the real number of deaths under investigations [DUIs], i.e. lumped all killings including homicide and murder into one bloated figure which they fondly calls “extrajudicial killings,” in line with the Soros funded Human Rights Watch and Amnesty International regime change dictionary. … Rappler and other Deep State actors headed by ex-CIA appointed President Fidel V. Ramos, and the pro-Deep State Liberal Party members, are all forced to find another negative issue they could pepper the Duterte government with. By leaking the Trump-Duterte call transcript, the Duterte government will have its reputation tarnished as it cannot be trusted with diplomatic secrets anymore. This is part of the long-term objective of the local Deep State actors. “… I have gotten several emails from my DFA contacts which allege that former Foreign Secretary and Yellow-Cult [Liberal Party] hard-core Albert del Rosariohas maintained a small core of DFA officials loyal to him—and anti-Duterte—in the department’s headquarters here and abroad. My DFA sources claimed that partly because of these anti-Duterte officials, the department has done practically nothing to correct the country’s image in the West that there have been massive human rights violations because of Duterte’s war against illegal drugs. 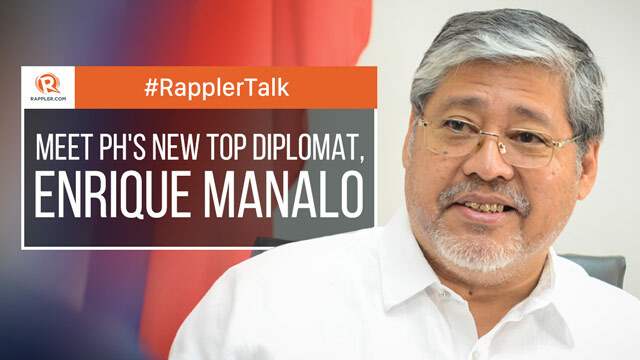 Rappler was the only news outfit that reported that del Rosario recommended that then acting foreign secretary Enrique Manalo be appointed permanent DFA head, based on his experience of working with him for five years. After Alan Cayetano’s appointment as DFA head, Manalo has returned to his post as undersecretary for policy. The memorandum containing the Trump-Duterte transcript was coursed through him. … How can such a weak nation like us that had three American lackeys as presidents in its recent history, reassert its independence from its former colonizer and its Western allies if traitors in the DFA in collusion with the Yellow Cult leak to the world confidential documents? 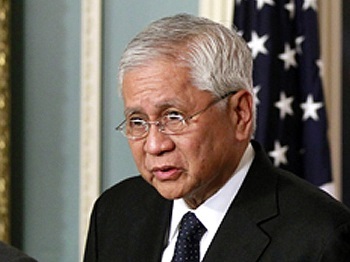 It was during the tenure of Albert Del Rosario as the DFA chief when the UNCLOS arbitral case was filed at The Hague against China, regarding the South China Sea/West Philippine Sea conflict. This man is, through and through, a diehard pro-US Deep State in the same mold as Fidel V. Ramos. Enrique Manalo is a former Philippine ambassador to the United Kingdom, Belgium, Luxembourg, United Nations and the EU. In short, he has properly assimilated himself to the “Western Deep State values” prior to his serving as the Acting Secretary of Foreign Affairs of the Philippines from March 9, 2017 until May 17, 2017. In fact, his own wife is a non-Filipina by the name of Pamela Louise Hunt. Rappler and other media outfits, have been publishing Manalo’s curriculum vitae to promote their guy. Colonial mentality has been a perennial problem in the country where those who can speak fluent English and Spanish consider themselves as a cut above the rest. It is only now that a deeper sense of nationalism has been given importance by Duterte himself. Consequently, those who are supporting Duterte were all called Dutertards, as if Rappler and others like it have the monopoly of wisdom in this part of the world. The Deep State’s local godfather, Fidel V. Ramos, also decided to suspend his retirement and started criticizing Duterte’s martial law proclamation for Mindanao. Fidel Ramos was the Chief of the Philippine Constabulary during Marcos’ martial law regime, when he ignored and permitted the abuses of his PC personnel in the countryside to malign the latter, in preparation for the CIA instigated “EDSA People Power Revolution” that toppled Marcos in 1986. Not only that, Ramos was also complicit in the growth of the Abu Sayyaf in the Philippines. Rappler’s double faced character is best illustrated when it denied that it is the one sourcing the leaked material from the DFA, but from The Intercept, yet we can read from the same Intercept article the byline “In partnership with Rappler.” Certainly, The Intercept has no direct contact at the DFA, but Rappler does. Rappler further justified its own publication of the Trump-Duterte conversation transcript “from The Intercept” as akin to that of the leaking of the Pentagon Papers, obviously taking its cue from The Intercept. The problem for both shenanigans is: there was no crime committed by both Trump and Duterte when the two were sharing information and exploring ideas on how to deal with North Korea, because the two countries that they are representing, respectively, have a standing treaty on military alliance, dating back to the granting of the Philippine independence from the US, in 1946. Whereas, in the Pentagon Papers there was a potential high crime committed by Pentagon officials regarding how the Vietnam War was conducted [much like with the Collateral Murder Iraq War video leaked by Pvt. Chelsea Manning], in the Trump-Duterte transcript, there was none. There is a good indication that Rappler may have allowed its platform to be used by the Deep State stooges at the DFA solely for its own benefit, i.e. gaining additional readership as it has been suffering lately from its dwindling readership due to the high popularity of the Duterte government, and its organic social media activists-supporters who are actively destroying Rappler’s fake news. In fact, some of these activists have far more followers than Rappler. Incidentally, this Rappler’s action was highly welcomed by its sister online media platform, The Intercept, as the latter would want the leak for its own anti-Trump agenda, and possibly to gain more readership, too. The problem in the case of The Intercept is: Trump’s leaking of the “two submarines lurking beneath the North Korean EEZ” to Duterte is not a crime, like it should be when Trump is talking critical military information to a non-ally like the Evil Russians. In its desire to make a follow-up to its highly successful Snowden NSA leak and be ahead of the rest in the New Media community, The Intercept deemed it prudent to spread a non-issue, yet highly politicized materials from the local Philippine media. The Intercept’s Jeremy Scahill is even proud to show his face and tell “his story” directly to his fellow pseudo-alternative journalist, Amy Goodman, of the Democracy Now, like he was here in the Philippines and know exactly who Duterte really is. The problem with what Scahill is saying about Duterte is that all of them are sourced from fact twisting local mainstream media like Rappler. Another problem for both Scahill and Goodman is that both of them are using Duterte’s rhetorics, or verbal threats, against the druglords, as reflective of Duterte’s true character as a leader. It is a standard journalistic practice to sought the side of the party being accused of wrongdoing, but The Intercept has not done so as shown below. The real numbers as far as the “extrajudicial killings” in the Philippines is concerned has been rectified officially by the Philippine delegation to the UN, the latter of which concluded that there’s no extra-judicial killings at all, but is the direct result of the heightened police operations in the Philippines. A very high level of appreciation can also be seen from the residents of urban centers in the Philippines. … and yet Goodman continues to spew anti-Assad fake news using various Deep State pseudo-analysts. Together with Democracy Now, TheIntercept is using the Trump-Duterte leak in order to continue its anti-Trump campaign. But its own source of financial support already reveals why it is behaving so. The Intercept is an online publication launched in February 2014 by First Look Media, the news organization created and funded by eBay founder Pierre Omidyar. In short, it is in no position to claim journalistic independence as it is backed by companies with proven connections to the Deep State. In like manner, Rappler was organized by a former CNN newscaster Maria Ressa, through the financial support of e-Bay founder Pierre Omidyar, and this foreign funding of Rappler is, of course, a gross violation of the Philippine Constitution. The Duterte government already knows this, and that of the PhilStar’s foreign funding, yet it has remained tolerant to such violations. It is for this fact that the Deep State stooges in the Philippines have nothing to worry about as far as any retaliation from the Duterte government is concerned. But the population behind the president may not take it lightly this time around. Maria Ressa has a notorious record of divulging critical information which compromised ongoing government operations, e.g. Manila hostage crisis which saw needless Hong Kong tourist deaths back in 2010. The Manila hostage crisis, officially known as the Rizal Park hostage-taking incident, occurred when a disgruntled former Philippine National Police officer named Rolando Mendoza hijacked a tourist bus in Rizal Park, Manila, Philippines on August 23, 2010. The bus carried 25 people: 20 tourists, a tour guide from Hong Kong, and four local Filipinos. … Negotiations (which were broadcast live on television and the internet) broke down dramatically about ten hours into the stand-off, when the police arrested Mendoza’s brother and thus incited Mendoza to open fire. When hovered, footnote #6 would display “ABS-CBN News” in Wikipedia, like so. Snapshot of Wikipedia’s “Manila hostage crisis” article. Maria Ressa, who worked at CNN for nearly two decades, serving as Manila Bureau Chief from 1988–1995, and as head of ABS-CBN News and Current Affairs Department from 2004-2010, was at the helm when ABS-CBN broadcasted the arrest of Mendoza’s brother, leading the latter to shoot at some of his hostages. Now, Ressa has taken her antics to the next level, and has decided that it’s probably a good idea for the Philippine citizenry to enjoy some of the North Korean nuclear bombs. So, you see, we, the truly independent, reader supported alternative media, really have a big problem dealing with these falsehoods being peddled on by corporate funded pseudo-alternative media. The Intercept, Democracy Now, and the local Rappler, are all working with the Deep State agencies like the Human Rights Watch, Amnesty International, and other fake humanitarian groups under the George Soros Open Society Foundations’umbrella, to foster local dissent with the ultimate aim of changing regimes that are unfriendly to the Khazarian Mafia’s own geopolitical and geoeconomic interests. 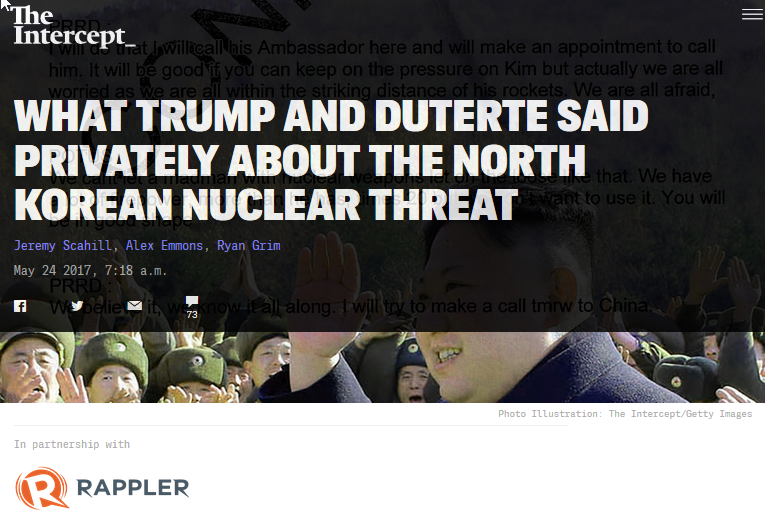 For their shared irresponsible action, The Intercept and Rappler have made the Philippines a legitimate target for the North Korean ICBMs. There is more than enough evidence to shut down Rappler, e.g. foreign funding, deliberate twisting of facts and unauthorized publication of diplomatic transcripts which endanger national security. This is probably the same reason why Marcos had to shut down the ABS-CBN during his time. ABS-CBN was established by the Eugenio Lopez family through a $3 million Deep State Citibank loan. What is also highly condemnable is the recent news item from another mainstream media outfit, that Vietnam and China are already engaged in hacking government files in the country. This may be non-news for the readers on this site, as almost everybody is hacking everyone. We interpret all of the above as a well-coordinated attempt to divide and pit the ASEAN members against each other, and against China, to deter the Duterte government from succeeding with its independent foreign policy. Freedom of expression does not include willful and deliberate twisting of facts. Leaking of state secrets that could result to injury of persons, or the destruction of the state itself, is irresponsible journalism. What Rappler has done is totally different from Snowden’s NSA leak, or Manning’s Collateral Murder video. Whistleblowing for the purpose of exposing high crimes is highly commendable. But Rappler and The Intercept‘s leaking of the Trump-Duterte call transcript to the public is the crime, and not Trump’s story about the “two nuclear submarines…” to Duterte. In response, the Duterte government must capitalize on the overwhelming sentiment of the people against fake news mainstream media, and should investigate the crimes committed by various Deep State actors to the fullest extent of its authority, and mandate to protect and defend the integrity and sovereignty of the Philippines. This is what’s being done in Russia and even in Hungary, where George Soros comes from.